Vina Robles Amphitheatre is a 3,300 seat boutique amphitheatre nestled on a picturesque, oak-dotted hillside in Paso Robles on California’s Central Coast. During its inaugural season in 2013, the venue hosted more than 32,000 fans, making it one of the largest outdoor venues for arts and entertainment in San Luis Obispo County. The venue offers a unique combination of tiered seating, fixed seats, VIP boxes, and a general admission lawn area that make it a one-of-a-kind musical experience. Construction of the new venue required septic tanks to store wastewater. The tanks were to be located under the main truck hub, so traffic rating was critical. The initial design used six 7’ x 40’ concrete boxes. However, the engineer and contractor were looking for a more cost-effective alternative. 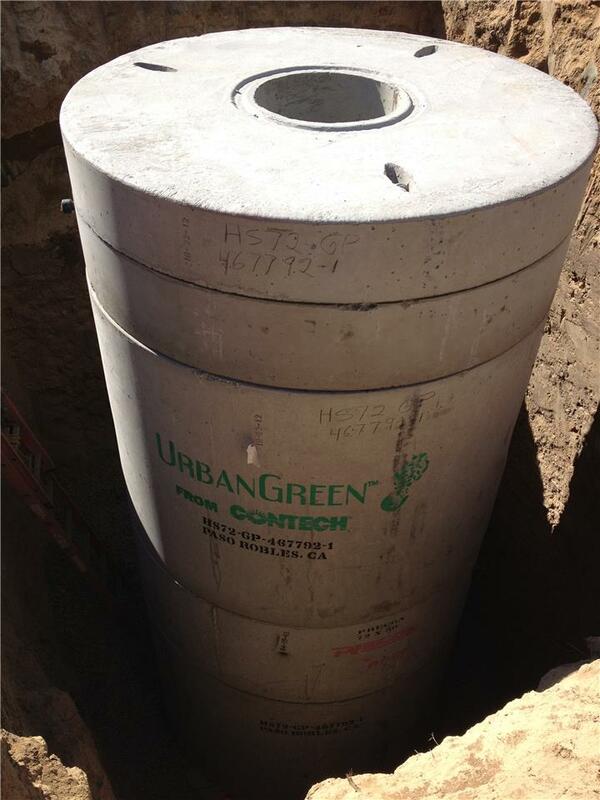 Contech proposed an underground system consisting of three 72” diameter DuroMaxx SRPE tanks, each 42’ long. The three tanks provide 1,187 cubic feet of storage. DuroMaxx was selected over concrete due to its ability to guarantee water tightness while meeting structural requirements. DuroMaxx is steel-reinforced polyethylene (SRPE) pipe commonly used in stormwater detention and sanitary sewer applications. The combination of 80 ksi steel reinforcing ribs and pressure rated polyethylene resin (PE) results in an extraordinarily strong and durable pipe. To ensure joint tightness, pipe sections and bulkheads were fusion welded at the plant and delivered in complete barrel lengths. After installation but prior to backfilling, the tanks underwent hydrostatic testing under the inspection of the City of Paso Robles. The tanks passed on the first test. Wastewater is collected in the tanks during events and is subsequently pumped out. To aid in disposal, the Contech design distributes wastewater to the separate tanks in series, encouraging the settling and retention of solids in the initial tank and using transfer pipes near the crown of the tanks to direct excess liquids to the adjacent tanks. Contech also provided a stormwater treatment solution. Stormwater runoff from parking lots and other impervious surfaces is directed to a VortSentry HS, a compact stormwater treatment system that employs helical flow technology to enhance gravitational separation of floating and settling pollutants from stormwater flows. The VortSentry removes floating and settling pollutants from stormwater before it is discharged into a basin. The small footprint of the VortSentry HS makes it an effective pretreatment option for projects where space is at a premium.